The Speed Booster Ultra 0.71x Adapter for Nikon G Lens to Micro Four Thirds-Mount Camera from Metabones allows a full-frame or APS-C Nikon F-mount lens to be mounted onto a Micro Four Thirds-mount camera. While doing so, the adapter's optics help to maximize the connected lens's apparent angle of view while providing a 1-stop increase for the camera over the lens's aperture range. If a lens intended for 35mm film or similarly sized full frame as well as APS-C camera sensors is connected to a camera with a Micro Four Thirds-sized sensor, it would project an image larger than the Micro Four Thirds sensor was built to accept. Able to capture only the center portion of the projected image, the effective angle of view of the lens would be narrowed, creating an in-camera "crop factor." The Speed Booster Ultra 0.71x Adapter for Nikon G Lens to Micro Four Thirds-Mount Camera condenses the light from a lens designed for APS-C as well as 35mm film, or "full frame" camera sensors and projects it onto a Micro Four Thirds sensor. This allows a Micro Four Thirds sensor to utilize more of the light gathered by a connected lens, which effectively reduces the crop factor while making available to the sensor an additional 1 stop of light for each of the lens's f/stop settings. This adapter is constructed from aluminum alloy for durability while minimizing weight and its mounting rings are made with brass to further prevent wear-and-tear. Inside are five lens elements in four groups that are designed to provide optical clarity as well as color fidelity, and a detachable tripod foot is included that features 1/4"-20 threads as well as compatibility with Arca-Swiss tripod heads. The Speed Booster Ultra 0.71x Adapter for Nikon G Lens to Micro Four Thirds-Mount Camera does not support electronic communication between an attached camera and lens. To help determine the amount of light that enters a Micro Four Thirds-mount camera when using this adapter and a Nikon F-mount lens, an aperture dial is built into the Speed Booster Ultra 0.71x Adapter for Nikon G Lens to Micro Four Thirds-Mount Camera. The aperture dial is designed to provide aperture control for Nikon G-type lenses, which do not have an aperture ring. Nikon AI or many post-Nikon AI lenses can have their aperture settings widened or narrowed using their built-in aperture control rings if preferred. Box Dimensions (LxWxH) 4.5 x 4.4 x 2.3"
Speed Booster Ultra 0.71x Adapter for Nikon G Lens to Micro Four Thirds-Mount Camera is rated 4.4 out of 5 by 84. Rated 1 out of 5 by Mike from Contacts too tight I bought this hearing only good things about Metabones. The optics worked as far as I could tell, but the contacts were too tight/large, and the moment I tried putting it onto my AF100, one of the contacts broke off. The other contacts pressed too tightly against some of my other EF lenses, causing small divots in their flat contacts. Then the Metabones felt fabric on the inside of the adaptor started rubbing off because everything was just too tight. I didn't even have an opportunity to test the aperture ability.So basically, it damaged (not fatally) my gear, and didn't work as advertised. I really hope I got a lemon. Rated 5 out of 5 by Anonymous from Works Perfect with the GH4 !! After about 2 weeks with this product I can honestly say I do not regret the price tag on this adapter. Every bit of this product is well made, and the firmware update was a 2 minute process. I switched to the ULTRA after buying the XL and I am so happy I switched. The Metabones website claims the XL is intended for the GH4, but I noticed an annoying vignetting. With the ULTRA the vignetting has disappeared with my Sigma 18-35mm lens. On the side of the adapter is a manual F-stop focus adjustment which I never use. All-in-all I'm happy with the ULTRA Metabones Adapter, and have noticed no lack of clarity in my photos / 4k video. GO BUY IT! Rated 5 out of 5 by Elijah from Metabones adapter for both EF-S and Full Frame lenses The Metabones adapter adds roughly a stop of light and widens your field of view on a given lens. The optics are great. If you are going to use any EF-S lenses on Micro 4/3rd cameras, this is the adapter to get. If you're only going to use full frame lenses, the XL .64x adapter will give you slightly more light and wider view. The only thing that I wish this did that it does not is allow aperture control from my GH5. Always a chance that it will be added via firmware, but no guarantees. There is an aperture control rocker on the adapter, so you can still change it, but it's not as intuitive to grab as the camera controls. Rated 5 out of 5 by Grant from Adapted Nikon glass to GH5s This product works great. I wish it were able to provide autofocus, but the focal length 0.71x conversion and 1 f-stop increase is awesome! The aperture is kind of ambiguous because it ends up converting it to just a slider ring which is manually controlled on the adapter itself. I think for photo this isn't ideal (and with the lack or autofocus), but for video it is totally fine. The lenses I have with VR built in do provide VR it seems, but it isn't nearly as effective as the Lumix native glass with OIS. Overall a great product to have available in my kit of mostly Nikon lenses and GH5S body. Rated 5 out of 5 by Anonymous from - 4K FULL FRAME AT A FRACTION OF THE COST - AMAZING COMBO I have been looking into the camera market for some time now and have done countless hours of research. It honestly comes down to what your needs our rather than strictly the best camera. For the price range of around $1000, there are several top contenders. I bought the GH4 for it's 4k ability while remaining an affordable product. If you are going to save money with the 4/3 sensor, than this product, the metabones speed booster is a must. It's the closest way you can imitate full frame 4k at a fraction of the cost. There are two different speed boosters however, the ultra and the XL. While the XL will give you a wider FOV (field of view) it really was only designed for 4k video and the extra crop, 2.3x, that comes with the GH4. The GH4 has so many more functions than just its affordable 4k that buying the XL only inhibits it. The 96fps is a great feature. Using the XL vignettes the lens, and that's something you never want. Especially because there's a lot of nice glass that uses an APS-C mount not a full frame. A great example is the Sigma Art 18-35. This is one of the best lens's that the GH4-Ultra Metabones can have. So, if you want to use the 4K, 96fps, 1080 60fps at 200mbs, and take photos, the 16mp camera can still take some stunning shots, buy the .71x Ultra adapter. It's the best third party camera mod you can do to create a cheaper micro 4/3 sensor a full frame 4K beast for a fraction of the cost. I did it and it worked amazing for me. And let's be honest, B and H is the top market vendor to buy from. They are going to hook you up with great customer service, fast shipping, and a clean, ready to go, product. Check out my youtube channel to see what the Gh4 and Metabones can do for you. Rated 2 out of 5 by zacphoto from Faulty product, poor customer service I purchased the Metabones Speed Booster to pair the JVC LS300 with my canon EF lenses. Starting with the good things: the .71x magnification is GREAT for keeping my wide lenses wide enough, and the extra stop of light seems almost magical. Considering the LS300 does have noise issues above 1600 ISO, being able to stop down my 2.8 lenses to 2.0 has allowed for some great low light shooting. The build quality feels great, and I am able to put some seriously heavy glass on the front of a fairly lightweight camera, and the connection feels rock solid. HOWEVER, my favorite lens, my Canon 85mm 1.2L II, doesn't work with this camera/adapter combo. It pairs with my Micro Four Thirds still camera, but not with the JVC. 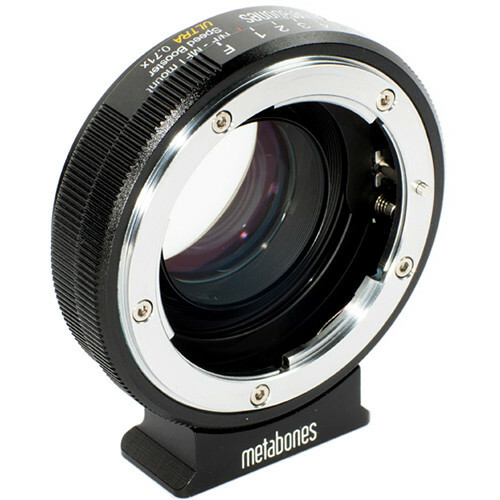 Of note: both the LS300 & 85mm 1.2L II are listed as compatible on the Metabones website. When I contacted customer service, they first asked me to ship the unit to them for testing and repair, on my dime. I have been using the LS300 for gigs every week since I bought it, so that was not gonna work. They then asked me to send them a video of the problem, so I did (basically, I showed them that as soon as the lens clicks into place, the LCD screen goes to black). Then they sent me replacement front and rear mounting plates to test out, but it did not solve the problem. Since then, their customer service has become non-existent. The last e-mail they sent me was two weeks ago, and all it asked was if there was any visible damage to the unit. I responded that no, there wasn't, and haven't heard from them since, despite several follow up e-mails. I feel like I've been ghosted. Nothing else does what the Speed Booster can do, and it is essential to my filmmaking kit, so I'm left without a lot of options. I will just say this is a very expensive product that may not work as claimed on both this site and the Metabones website. And in the event it doesn't work, the customer service at Metabones is spotty at best. Apparently, we buy at our own risk. Rated 5 out of 5 by Ting-Hui W. from Combine with Sigma 18-35mm, so amazing!!!! I use this adapter on Panasonic G85 with Sigma 18-35mm F1.8, so amazing, auto focus is fast enough for me. I love this product. I want to mount my nikon-mount nikon 24-85 f3.5-4.5, my tamron 70-200 f2.8 vc on a gh4 using this item, i am aware there will be no autofocus or aperture control. Will the vr and vc on those lenses still work? As the Metabones Speed Booster Ultra 0.71x Adapter for Nikon F-Mount Lens to Micro Four Thirds-Mount Camera does not have any electronic contacts to allow information to be transferred from the lens to the camera, no, you would not have any automatic usage, such as autofocus, autoexposure, or Vibration Reduction/Vibration Compensation when using lenses with this adapter. The lens would have to be used fully manually. The adapter does provide aperture control by allowing you to adjust the apture using its own built-in aperture ring. Two questions: will this work with a Lumix G9; and anyone use this with Milvus or Otus lenses on an MFT? Thanks. Will this version be compatible with Olympus OM-D cameras? Yes, as the OM-D line is Micro Four Thirds mount, this adapter is compatible. Does this reduce the focal length of the lens? Please take into account the crop factor of the camera also! For a camera with a 2x crop factor such as the GH5, a 50mm Canon FD lens would have the focal length of 100mm, you THEN multiply that by the adapter's magnification factor (in this case 0.71x), to get 71mm. Has there been a firmware update that allows the touch focus of the BMPCC 4k to work with EF lenses? Does anyone use Olympus OM lenses on this with a Olympus OM -&gt; Canon EF adapter? Olympus OM lenses are fully manual so they should work, I am concerned about them mechanically fitting on. Yes this works fine. The OM-&gt;EF adapter has a pin that locks the aperture in place so it works correctly with the camera.However, keep in mind that some OM lenses need to be modified in order to work. A bunch of them have metal protrusions on the back that would scratch the speedbooster element. They are fairly easy to remove, there are instructions on how to disassemble the back piece and unscrew the metal protrusions. Most of the time they can be put back on if you ever want to sell the lens. However, I did need to permanantly modify one of them.The Oly 50mm f/1.4 did not need modification. However I would be careful attaching a lens for the first time to avoid scratching the speedbooster lens element. Does this adapter allow me to use Cannon EF 70-300mm f/4-5.6 IS USM Lens on my Blackmagic Design Cinema Camera with MFT mount? Will I be able to use the manual focus on the lens? I have used this speed booster with all my lens from my TI Rebel EF Mount. I also use this with a Tamron 18mm-270mm Canon Mount and a Sigma 18mm-35mm with no issues. For more options, a good place to go for info is searching on Youtube. Does the Speed Booster Ultra have an infinity adjustment, like the original Speed Booster did? Yes, this has infinity adjustment.